I moved to Durango in 2005 and work as a civil engineer for the local county. I am originally from Columbus, Ohio and have since lived in Arizona and Colorado, with some time spent in West Africa and Southeast Asia. In Durango I have been involved with the Durango Dharma Center and the Durango Independent Film Festival. Outside of work and the vacation rental, I also enjoy biking, camping, reading, and hiking, especially with my 11-year old dogs, Neutron and Kozmo. Super clean, well equipped, charming, convenient location! Great place, very comfortable, clean and well stocked! We had a great time staying here while working in Durango. It’s very close to Main Street, an easy walk to restaurants and shops. Victoria was very responsive and incredibly accommodating. Would definitely stay in one of her properties again! Thank you. I hope you will be staying again! This was a perfect place to stay for our group of friends. Location was excellent and property is updated and very clean. Owner was friendly and accommodating. Lovely duplex a couple of blocks from the main downtown. Owner was very accommodating. Highly recommend! The Purple Juniper was a great. It was comfortable, convenient, and safe. The house was very clean and fully stocked. The mud room entry was key for all our wet clothing items after skiing and playing in the snow. Victoria was very responsive to our needs especially for a shovel just in case we needed to dig out our car, which we did. Victoria’s snow removal guy was was friendly and efficient. Our only complaint is that the couch is not large enough to handle more than 2 people and the green chair could use an ottoman so a group of 3 or more can relax more comfortably. This is a minor detail for this amazing place to stay in Durango. We will be back. Thank you for your review. It was truly epic snow while you were here! The sofa is 84" long, from Room and Board, and super-comfy, but I can see where its being split into two cushions (rather than three or four) may cause some to be more comfortable with just two people on it. Thank you again for your stay and being such a good sport with the overwhelming snow. 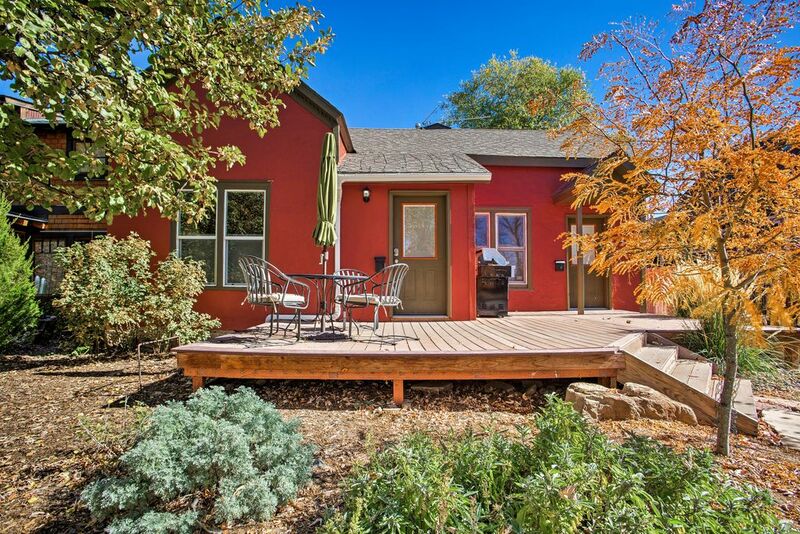 The location of this property was perfect for exploring downtown Durango. The unit was extremely clean and the number of kitchen utensils and cooking spices were far greater than in any property we have ever stayed. The owner was very responsive to our needs to the extent of shoveling out our vehicle after an 8 inch snowfall. We would not hesitate to stay here again and highly recommend this unit as a great location to explore southwestern Colorado. Thank you for such a kind note. The Winter here has been amazing; I am happy you got to experience it, and it should make for a beautiful Spring and Summer, too. Minimum of 5-night rentals may be made at anytime. Two-night rentals are available when reservation is made within 30 days of check-in. Payment is typically made in full at the time of booking for simplicity, but may be split into two with the second half due 45 days prior to arrival. Cancellation policy provides 75% refund when 30 days or more notice is provided. Within 30 days of check-in, no refunds are given. As booking a vacation home is unique from standard hotel lodging with respect to cancellation, trip insurance may be a good investment to cover unforeseen circumstances.